I should have posted this much sooner, but got busy and lazy. Anyways, March has been an awful month emotionally and financially. Let's hope all the bad luck stays there. If she keeps spending money this way, I'll need to go find a better job. I got a few trial size THK Verve to try out as Zeal is a bit too expensive for us. I also got her some raw beef to go with the meals. The tooth incident and swollen paw sure wasn't fun at all. We also had to stock up on Frontline and Heartgard. Those weren't cheap either. Maya spent a day at daycare in preparation for our Hawaii trip. 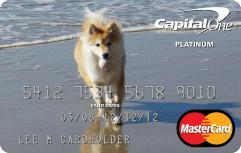 Somewhat related to finances, I got a new credit card with Maya's photo on it. I have been planning to get one with both of us since the day we got her, but somehow I couldn't find a picture which we both look good. I blame my boyfriend's picture taking skills, while he thinks that's just how I look and he can't make a Gisele out of someone who's not. Since I just realized I can make a new one every 30 days, I decided to get one with Maya on it instead.